Obtenha uma visão geral dos pontos turísticos mais importantes do Rio durante este abrangente tour de 8 horas. Com um guia local, viaje pela Floresta da Tijuca, parando em Paineiras para embarcar no transporte até o topo do Corcovado, casa da estátua do Cristo Redentor. Pegue o teleférico da Urca até o topo do Pão de Açúcar e depois almoce em uma das melhores churrascarias da cidade antes de visitar o Estádio do Maracanã e o Sambódromo. O transporte de ida e volta dos hotéis do Rio está incluído. This was our second scheduled tour in Rio after the first one turned out to be terrible. However, our anxiety was almost gone once we met our tour guide and boarded the bus. Our tour guide was Renata. She is a very nice lady and she exudes professionalism in the way she interacts with her customers. She is fluent in English, Spanish, French and of course Portuguese. This came in handy as our bus held travellers with all the nationalities. She made sure all questions were answered and she took time to explain history and facts of the sights. She was very clear on instructions and always on the lookout for all of us. The tour was a fast paced one and we saw so much of Rio in 1 day. The lunch was delicious and the variety of food is amazing. The sights were every bit as beautiful as everyone expected. We will treasure this memory for a long time. This was a very good tour, and Renata was the one who made it an outstanding one. Don't miss this! Highly recommended! The all day tour of Rio was wonderful. We had a terrific guide and driver. Pricilla and Berlin were very accommodating. It rained heavily when we started out in the morning, so they rearranged the day and waited for the afternoon to go to Sugarloaf mountain and Christ the Redeemer. The afternoon cleared up and turned sunny. The Brazilian BBQ was very good. I appreciated the smallish group. Overall, a good day. Excellent tour and a very informative guide (Newton). Picked up on time, very knowledgable, excellent lunch,the tour was well paced and we had an excellent day with plenty of time to take in the wonderful sights. Great way to see the main sights of Rio with pick up and drop off at the hotel and Christ the Redeemer the first stop. The guide was informative and lunch all you can eat . Renata was an incredible tour guide. This is a must for all visiting Rio de Janeiro. I strongly recommend this tour. Christ the Redeemer and the other places were amazing. Our tour guide spoke wonderful English and the home town Portuguese as well as Spanish.Our Mercedes van was nearly brand new and the drive handled the traffic perfectly.Lunch at a wonderful Brazilian steak house was very good and filling. It was to be a 8-hr tour but lighting trapped us at Sugar Loaf Mountain as power was lost. The tour guy was an expert and we were able to see many attractions during the tour. Very good experience of the city of Rio de Janeiro. Family had a great time. Tour guide took excellent care of our two small kids. We enjoyed going on Sugarloaf and seeing the Christ statue. This was my first trip to Brazil and Rio, and because I had limited time in Rio, I wanted the best 1 day tour of Rio highlights. It was awesome! It was punctual, fun and learning experience thanks to the great staff in Vincent and Alvez!! I recommend booking this tour from this company: very satisfied! My fiancee and I decided to explore Rio all at one shot and booked the Full Day in Rio Tour. Our tour guide, Vincent and driver were excellent. They were extremely friendly and knowledgeable about the city of Rio and the various attractions. Vincent spoke English, Spanish, and Portuguese so it made it easy for us to learn about Rio and ask any/all questions. This tour was everything we expected and much more. We were punctually picked up at our hotel. Before 9 am we were on our way to start the tour. The tour felt intimate given the group was not a large group. Christ the Redeemer statue was the first attraction on our agenda, but because the day started out cloudy and their was limited visibility, Vincent wisely altered the agenda to allow us to get the best out of our tour.In our opinion, the two highlights of the tour were the Sugar Loaf Mountains and the Christ the Redeemer statue. The views were breath-taking. 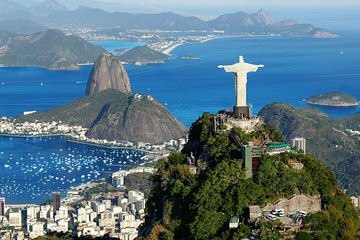 Both are a must see experience.The other stops along the trip were also great (Seleron steps, Maracana Stadium, the Cathedral, etc.) however, less time is spent at these sites given their are a lot of sites to cover and a limited time to cover them. Most of the time is spent at the Sugar Loaf Mountains, Christ the Redeemer, and lunch. Moreover, we had lunch at an all you can eat churrasco/carnicería restaurant (Carretao), which is highly rated on yelp. The food was amazing. It was very authentic and the quality of the food was very good.Overall, this tour was worth every penny (Real). One gets a little bit of everything on this tour. I highly recommend it for anyone who wants to experience Rio. If you do, hopefully you can explore Rio with Vincent!